Tangy sweet waffles made with eggnog and sourdough starter. 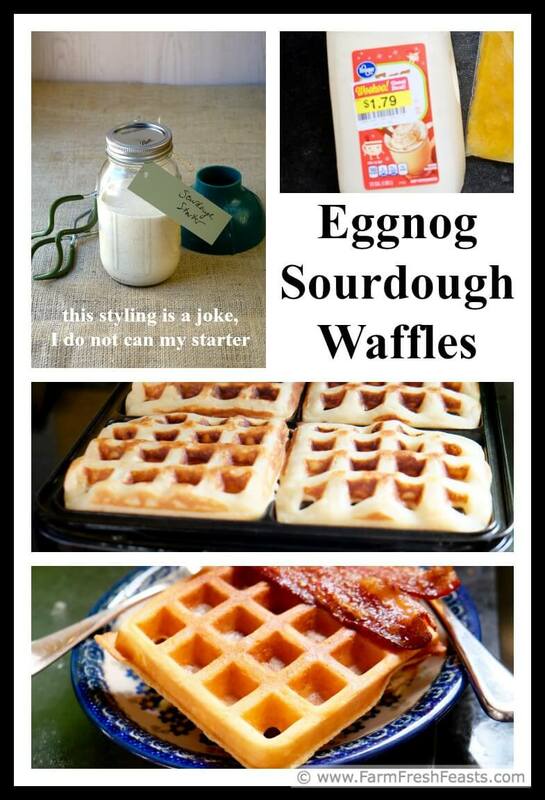 A fun way to enjoy eggnog during the holiday season--and marked down eggnog after the new year! I'm a sucker for magical markdown stickers. Where some people see 'oh it's about to go bad' I see opportunity. I picked up a half gallon of eggnog with no clear purpose. Buying food not on a previously thought out list is NOT a good way to Reduce Food Waste, however it is a source of inspiration to me so I'll keep on doing it. Within reason. Walking to the grocery store as I have been for the past 2 months when all I need is a gallon of milk has really cut down on impulse purchases. I've used eggnog in waffles before--my Pumpkin Eggnog Waffles with Chocolate Chips made it onto the blog, but the Pumpkin Effnog waffles I never did find in my earlier photo searches, even though I was pretty sure I'd made some before. [Note to bloggers, when pulling photos off your camera, check the spelling as you add labels.] Eggnog in French toast? You bet I went there. What about oven pancakes? Yes, I've used eggnog in my Finnish Oven Pancake. Heck, I've even used eggnog in savory pizza dough with butternut squash. I do drink it, though it may not seem that way by all of these recipes. I have to interrupt my flow with a behind the scenes photo--Robert Barker eyeing the bacon. Don't let the short legs fool ya. He swiped a piece of coconut cream pie off the counter last month. He's a dickens and I love him. I wanted to share this recipe now for two reasons--first, it's been a while since I've shared a sourdough recipe and second, because I got my initial sourdough as a stocking stuffer, and I wanted to put the bug in your ear about giving a dried sourdough starter as a holiday gift. This is an Amazon affiliate link to the starter packet I started over 2 years ago, which is going strong in my fridge as I write. And still going strong as I type. For more sourdough recipes, I've got a Pinterest board of Sourdough Suggestions. Follow me on Pinterest to see my latest finds. Want some day to day photos? Follow me on Instagram. How about my failures and other bloggers' successes? Follow my FB page. As always, if you'd like to Use This Blog, click here. Note: this recipe is started the night before, using unfed sourdough starter straight from the fridge. Start the night before you want waffles for breakfast. In a large bowl, stir together the first 4 ingredients until well combined. Cover loosely with a kitchen towel and leave on the counter overnight. The next morning, whisk in the remaining ingredients until combined. Walk away. Just walk away! Let the batter rest for 30 minutes to an hour. 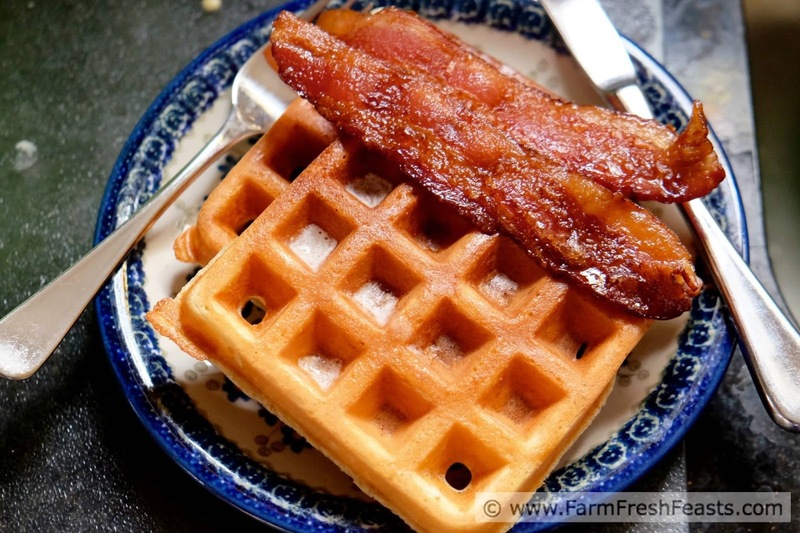 Preheat your waffle iron to your standard setting (I used the medium setting on mine) and spray with an oil spray. 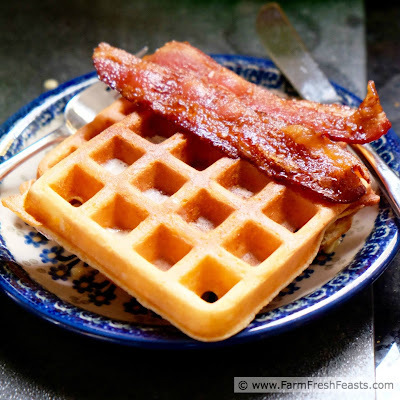 Pour the correct amount of batter for your waffle iron (I use about a half cup per waffle on mine) and bake according to manufacturer's instructions. Crap, let the season of the waffles begin....and me without a maker. Insert sad face here. 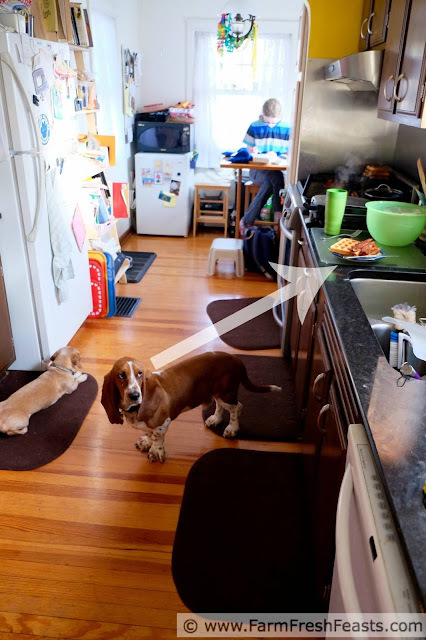 Also, we both included pets eye balling our food in today's post. Sam is a dickens too and I love her as well. There's always Santa for waffle irons. I am feeling a deja vu here. 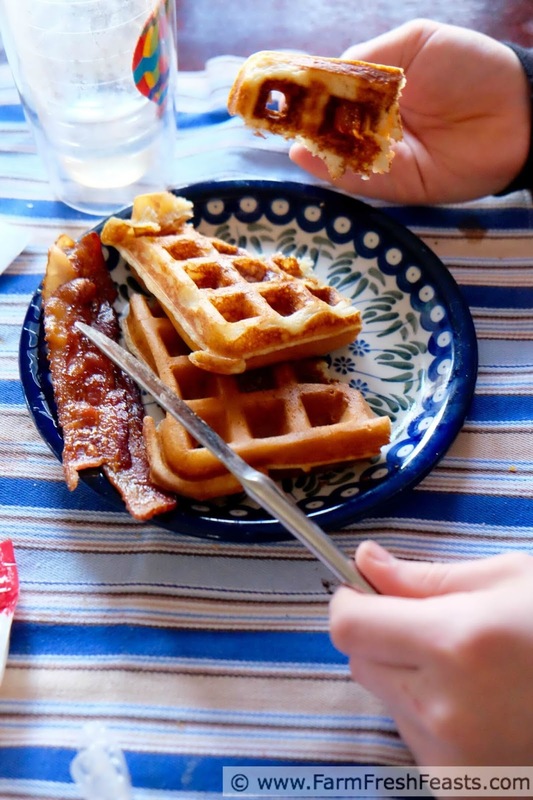 Especially with a babe on the way, it's easier to throw the batter into the waffle iron, close the lid, deal with the kid (or Sam) and come back when it beeps to get your hot food that you won't have a free hand to eat until it's cold and . . . well let's just save that little new mommy tidbit for later now, won't we? Very creative, it looks wonderful, I'll have to try these. I truly don't know if I am creative because I am desperate or if I am creative despite being desperate.